It’s not what you expect to hear from anyone, least of all from the world’s leading pharmaceutical company. And that’s the point of our new effort with Pfizer. Get Old may not be what we expect to hear, but it’s what we all hope to do: live longer, do more, see more. It’s a call to rethink our assumptions about our futures in light of medical science’s promise combined with our own potential. Get Old is a unique, provocative platform built on a core human truth – that everyone wants to live the longest, fullest life possible, at any age. This platform encourages dialogue, celebrates experiences and provides a space to share the wisdom and knowledge that come with getting older. Get Old represents a new bottom-up, listening-based approach for Pfizer, an effort to support a very important conversation in channels where people are already conversing. 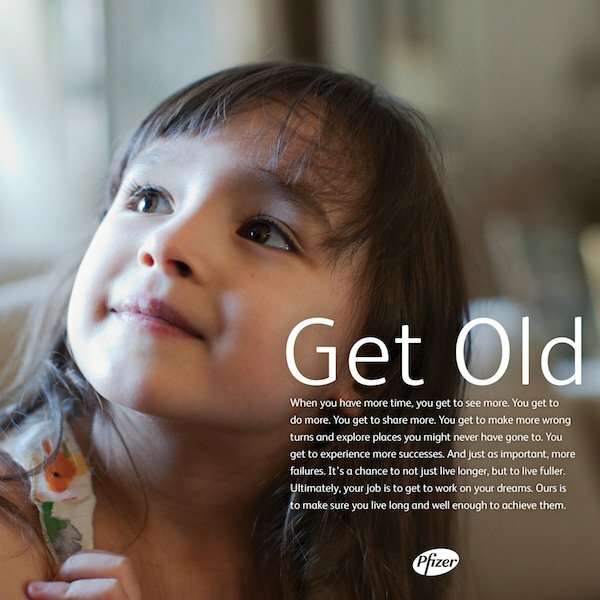 Visit GetOld.com to tell us how you feel about getting old and to dive into the stories, videos, tips and information shared by Pfizer, their partners and ordinary people. Join the conversation by liking the Get Old page on Facebook, follow us on Twitter @GetOld and under the hashtag #LetsGetOld. And If you’re near Pfizer’s worldwide headquarters in New York, at 42nd Street and 2nd Ave, come see our window installation. We have the privilege of doing a lot of great things for a lot of great clients, but, every now and then, we get the chance to do something that brings together all of what we do best. For us, this has been one of those.